INDIANAPOLIS (AP) With a huge deficit to make up, the Indiana Pacers started letting it fly from long range. 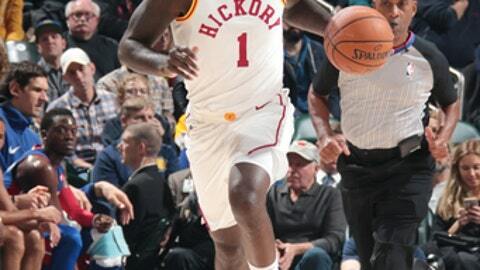 Reserve guard Lance Stephenson scored all 13 of his points in the fourth quarter, including a key 3-pointer in the final few minutes, and the Pacers rallied from 22 down to defeat the Detroit Pistons 107-100 on Friday night. The shot clock was about to expire when Stephenson launched from well beyond the arc to give Indiana a 101-97 lead with 2:03 remaining. It was one of six 3s the Pacers made in seven fourth-quarter attempts as Indiana outscored Detroit 36-19 over the final 12 minutes. ”I just wanted to win so bad,” Stephenson said. The Pistons (10-5) led 78-56 in the third after a 20-2 run and were still ahead by 10 entering the final period. The Pacers (8-8) have won six consecutive home games against the Pistons. Pistons guards Reggie Jackson and Avery Bradley had 16 points apiece. Pistons: Off to their best start since opening 12-2 in 2005-06. Only seven teams in franchise history have started 10-3 or better. … Detroit is 7-1 at home and 3-4 on the road. … Bradley averaged 24 points in the previous three games. Pacers: C Myles Turner has scored in double figures in six of eight games since returning from the NBA’s concussion protocol. … Point guard Darren Collison ranks fourth in the league with a 4.5 assists-per-turnover ratio. … Oladipo has scored 20 or more points in 12 of 16 games. The Pistons have hit a franchise-record 12 or more 3-pointers in six consecutive games, including 14 on Friday. They’ve reached double digits in 3s in 10 of 15 games overall and are 6-4 in those games. Pistons center Andre Drummond, the NBA’s leading rebounder at 15.8 per game, is the first player to grab at least 200 rebounds in the first 13 games of two different seasons since Dennis Rodman did it three times for three different teams in the 1990s: the Pistons in 1992-93, the San Antonio Spurs in 1993-94 and the Chicago Bulls in 1996-97. Drummond, who reached 200 rebounds in his 13th game this season, needed just 11 games to eclipse that total in 2015-16. Pistons: Sunday at Minnesota, which has lost five straight to Detroit including 122-101 in the Motor City on Oct. 25. Pacers: Sunday at Miami, which has won six in a row at home against Indiana.